Young adults need information on issues of sexuality in a way that relates to them. This becomes particularly important to young adults who identity as gay, lesbian, bisexual, transgendered, or queer, as well as those who may be questioning their sexualities. This paper examines one form of information: the young adult novel. 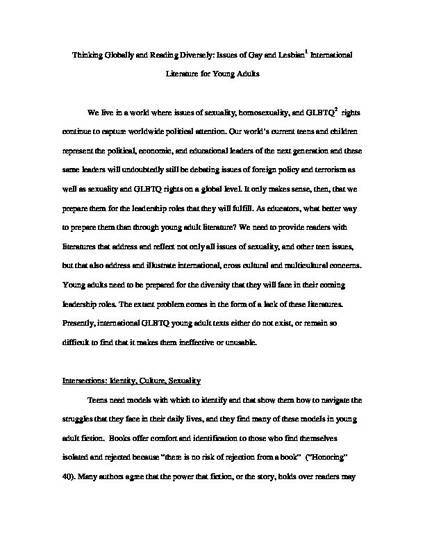 It looks at the presence, lack, and need for international GLBTQ young adult literature. It surveys the genre’s past and present and speculates on its future. It discovers that although publishers have significantly increased GLBTQ and international GLBTQ young adult literature in the last few years, there is still quite a gap to be filled.